As temperatures rise in Vietnam, a nationwide drought has dried up riverbeds, sparked forest fires and now threatens one of the world's richest agricultural regions, upon which millions depend for their livelihoods. "The Mekong Delta is facing a serious drought," Nguyen Minh Giam, deputy director of the National Hydro-Meteorological Forecasting Centre for the southern region, told IRIN. Water levels on the Mekong River are at an almost 20-year low, largely as a result of the rainy season ending early and a precipitous drop in water flow upstream, he said. With virtually no rainfall in the north since September, fires have burned through the northern provinces of Lao Cai and Lai Chau. In central Vietnam, sustained temperatures of about 38 degrees Celsius have sent hundreds to local hospitals. According to the Ministry of Natural Resources and Environment, the heat and humidity have sparked a plague of insects and worms, which have eaten through thousands of hectares of rice paddies. The drought conditions in the delta are also being felt in other Mekong countries because of the early end to the 2009 wet season, as well as low monsoon rainfall. The Mekong River Commission, a regional monitoring body, on 26 February warned of significantly lower than average water levels on the Mekong River in Laos and Thailand, which it says will affect the economic development of already impoverished people there. The Red River, upon which millions of Vietnamese in the north depend for fishing and irrigation, is at its lowest in more than 100 years, according to records beginning in 1902. The drought has turned sections of the normally bustling river into sand dunes, bringing river traffic to a halt. "Never before has the water been so low that most ships cannot move," said Nguyen Manh Khoa, from Phu Tho province, whose debts are piling up as his new boat sits idle. From the Tibetan Plateau, the Mekong river runs through China's Yunnan province, Myanmar, Thailand, Laos, Cambodia and Vietnam. Each day Khoa does not work hauling cargo on the Red River he loses about US$80. But after getting his boat stuck on the sandbars several times, it has become too risky to venture out. With the spring rice crops already in, frantic farmers living along the Red River have had no choice but to pay out large sums to private entrepreneurs armed with pumps to extract dwindling amounts of water for their fields. As an emergency measure, the government has released water from its reservoirs, which are at critical lows. But the seedlings are competing with the state-owned hydroelectric firm, which says it will need the water to meet record-breaking power demands as temperatures are set to soar this summer. The region under greatest threat, however, remains the southern Mekong Delta, known as the nation's rice bowl, where the Mekong River flows into the sea. During the dry season, salt water from the South China Sea can push 30km inland. This year, communities as far as 60km up-river are reporting salt contamination. "Salinization has been a pattern in the Mekong Delta the last 30 to 50 years, but things are getting worse every year due to climate change," said Pham Van Du, deputy director at the Department of Planting in the agricultural ministry. He estimates that 100,000ha of rice in the Mekong Delta are under threat. Some blame China, where the Mekong begins, for Vietnam's water woes. 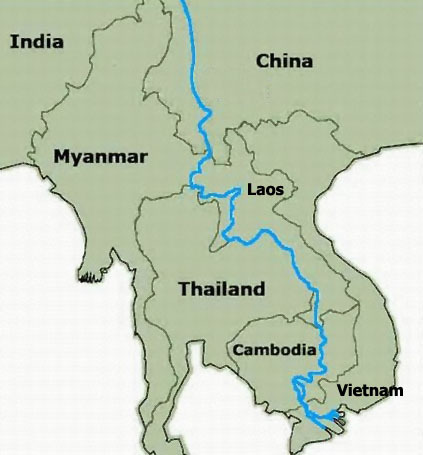 According to the Mekong River Commission, China has built or is planning to build eight dams on its side of the border. But meteorologists say the return of El Niño, a cyclical warming pattern, is the real culprit. Ian Wilderspin, senior technical adviser for disaster risk management at the UN Development Programme in Hanoi, said climate change meant Vietnam would experience droughts that arrived sooner and lasted longer. The government has moved to assist farmers by releasing water from the reservoirs and installing pumps. But considering the magnitude of the problem, "more needs to be done", he said. "We have to look at the ways and means to build resilience of local communities," said Wilderspin, whether by providing drought-resistant seeds, planting different crops or protecting fresh water sources. "Climate change is only going to make these cycles worse."